1. Visited the City of Johannesburg, South Africa and the Township of Soweto to learn more about the history of the people, land, and the cultural environment as a result of the apartheid movement that left the country plagued with great disparity and systemic inequality. 2. Toured the Hector Peterson, Apartheid, and District Six Museums to learn more about the struggle of South African Youth within the educational system and race relations as a whole that led the people to feel oppressed by the enforcement of Afrikaans language and Dutch colonialism. 3. Visited Nelson Mandela’s home and the Freedom Square in Soweto to learn about his historical contributions and enforcement of the written Constitution that promoted equality in every area of life on behalf of all the country’s citizens when he was elected as President of South Africa in 1994. 4. Visited and toured by boat, bus, and feet the Prison in Robbins Island where Nelson Mandela served his 27 year sentence in total isolation, solitary confinement, and solitude. 5. Toured the Lesedi Cultural Village and learned about the traditional lifestyle, settings, foods, clothing, music, dances, culture, customs, traditions, and languages of the Zulu, Xhosa, Pedi, Basotho and Ndebele tribes. 6. Toured in a wildlife safari adventure on a private game reserve at Kruger National Park to learn about the lifestyles, habitats, and settings of the big five and many other species while experiencing nature from an elevated, up close and personal view. 7. 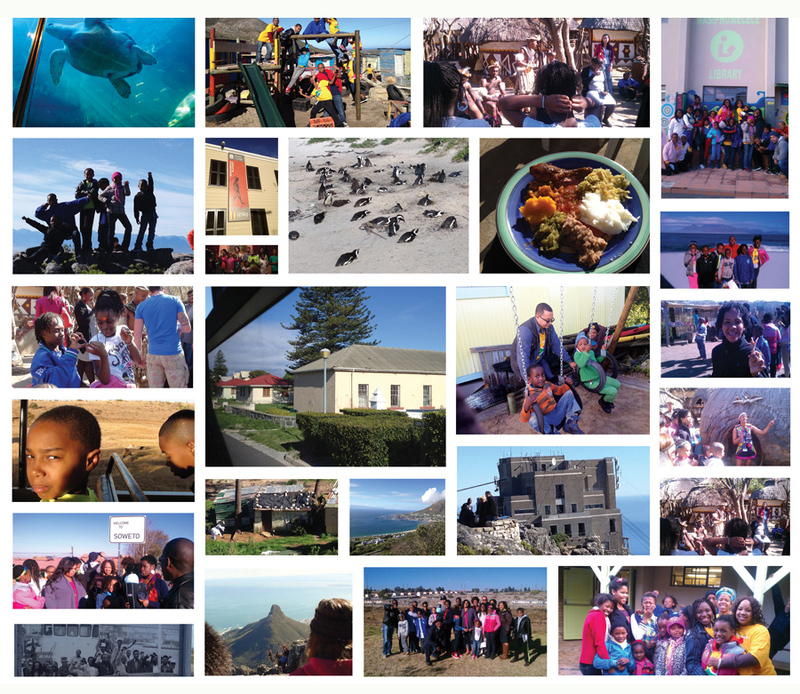 Visited and toured the city of Cape Town South Africa and some of its major attractions such as Simon’s Town, Cape Point, the V & A Waterfront, Two Oceans Aquarium, and Table Mountain of which they took a trip by cable car to view one of the 7 wonders of the world. 8. Went to the Kirstenbosch National Botanical Garden, home of over 22,000 indigenous plants, along with the children of the advocacy group “Grandmothers Against Poverty and HIV/AIDS” in which they studied and performed scavenger searches focused on identifying the native plants most significant to the Western Cape. 9. Visited the Slave Lodge, one of the oldest buildings in Cape Town and an original port for the auction of slaves during the transatlantic slave trade that has ironically transformed from a place symbolic of a long history of slavery and dehumanization to a place reflective of justice and human rights. 10. Volunteered and interacted with youth at Red Hill, Children of Hope Educare Centre, and Masiphumelele’s Library, all of which are housed within an informal settlement outside of Cape Town South Africa. 11. Visited Cheetah Outreach to learn about adult cheetahs, their cubs, and a few other endangered species while getting a chance to pet and take pictures with them.